The diabolical Player Killer, Pegasus' second gaming assassin, challenges Yugi to a duel of darkness! In the shadow of the "Castle of Dark Illusions" card, an army of lurking monsters hungers to steal Yugi's life points, and if he loses, his actual life! As the tournament continues the action moves underground. 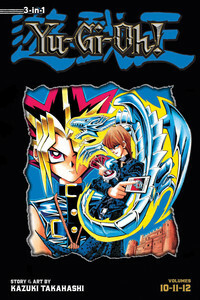 Trapped in the tunnels beneath Duelist Kingdom, Yugi and Jonouchi must conquer the maze of the Meikyu Brothers in a two-on-two duel. Waiting in the Brothers' deck is the Gate Guardian, lord of the underworld and one the most powerful monsters of all. Collects volumes 10-12 in omnibus format.